Review posted April 24, 2014. Amulet Books, New York, 2013. 391 pages. I like the blurbs at the front of Constable & Toop. They're by "The Ghost of Oscar Wilde," "The Ghost of Dr. Johnson," and other distinguished ghosts. The Ghost of Emily Brontë says, "I very much enjoyed the melancholy and tragedy contained within these pages. The humor was less to my taste." Sam Toop can talk to ghosts. The ghosts know him as a "Talker," and often ask him to help them with their unfinished business, like give a message or uncover a hidden will. But there's something terribly wrong at the church where one of the ghosts wants his body buried. Meanwhile, Lapsewood has been doing his desk job faithfully, in death as in life. But when he gets transferred to another department, and expected to check on residents of haunted houses, as the past Outreach worker has gone missing, he also stumbles on something terribly wrong. At the same time, Clara's parents invite an exorcist to their home. As Clara had suspected, they did have a ghost haunting their home, but the exorcist banishes her. After that event, nothing feels right, but things are even worse after the body of a girl is found in their home. 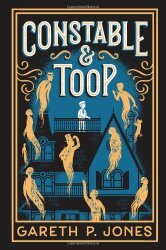 Constable & Toop is set in Victorian London, at a time when people were obsessed with death and funerals and the supernatural. Gareth Jones spins an entertaining tale of plots and murderers, among the living and the dead, and good people who try to do their bit to help. This story is highly imaginative, intricately plotted, and a whole lot of fun.